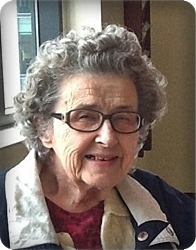 Valora Mae Beach, age 94, of Grand Rapids, went to be with her Lord on Thursday, November 1, 2018. Valora loved puzzles and playing and listening to music. She was preceded in death by her husband, Sammie Beach Sr; four brothers, two sisters, one brother-in-law and two sisters-in-law. She will be lovingly remembered by her children, Sammie Jr. (Ann) Beach, Susan (Jim) White, Sheri Beach, Sally (Bill) Steenwyk; six grandchildren, 10 great grandchildren; sister, Audrey (Maurice) Anderson; brothers-in-law and sisters-in-law, Thomas Beach, Ruth Andrus, Allen (Joan) Beach; and many nieces and nephews. The family will greet relatives and friends on Saturday, November 10, from 10 - 11 am at Stroo Funeral Home (1095 68th St. SE) where the funeral service will begin at 11 am. Pastor Ken Van Wyk will officiate. Interment will be in Rest Lawn Memorial Park.